A recently discovered hormone that occurs naturally in the human body is being studied as a potential treatment for health problems including infertility and diabetes — it could also be used to make IVF even safer for the women involved. The hormone, kisspeptin, might play a leading role in female and male fertility. Scientists think it stimulates the production of gonadotropin-releasing hormone, in turn boosting follicle-stimulating hormone and luteinizing hormone creation by the brain’s pituitary gland. In women, these two hormones stimulate the ovaries to produce an egg for ovulation; in men, they stimulate the testes to generate sperm. Kisspeptin, first identified by British researchers in 2003, gained its unusual name because its production is controlled by a gene known as KISS1, itself discovered in 1996 in Hershey, a town in the US home to a brand of chocolate called Hershey’s kisses. It is produced by the hypothalamus region of the brain and is now the subject of several clinical trials across the world. Early studies suggest it could help prevent miscarriage in women and offer a safer form of IVF, as well as treating delayed puberty in boys. While there is much still to be learned about the hormone, kisspeptin levels in the bloodstream are known to rise naturally during pregnancy. A study published last year by Imperial College London suggested it could help to predict a woman’s risk of miscarriage. Blood samples were taken from 993 pregnant women and measured for levels of kisspeptin. Women who later miscarried were found to have levels 60 percent lower than those who went on to have healthy pregnancies. Measuring kisspeptin was found to be a more accurate predictor than the current test, measuring levels of human chronic gonadotropin, a hormone released by the placenta and important in maintaining pregnancy. 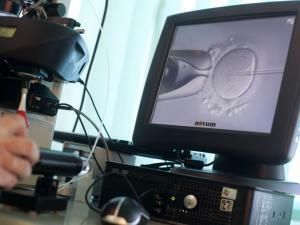 Kisspeptin might also help couples undergoing IVF (in-vitro fertilisation) treatment. Although widely and successfully used to enable infertile couples to conceive, IVF treatment can result in ovarian hyperstimulation syndrome (OHSS), a potentially life-threatening condition. 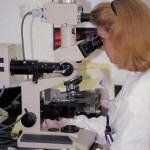 Mild forms of OHSS occur in around one in three of all IVF cycles, and moderate or severe forms occur in one in ten cycles. The problem occurs because of the use of human chronic gonadotropin — women having IVF are given injections of this hormone to stimulate egg production. But sometimes the ovaries go into overdrive, triggering symptoms such as pain, diarrhoea, nausea, headache and hot flushes. In severe cases, OHSS can cause kidney problems and can even be fatal. Kisspeptin triggers the process that results in the release of an egg from the ovary and might be a safer option. Unlike human chronic gonado-tropin, which remains in the blood for longer after an injection, kisspeptin is broken down more quickly, lowering the risk of overstimulation. Last year, researchers at Imperial College reported the results of the first human trials using kisspeptin in IVF: 12 out of 53 women given the treatment successfully gave birth. In yet another trial at Imperial College, 100 healthy men and women will be fitted with a tiny pump on their tummy to deliver the hormone, or a placebo saline solution, 24 hours a day for up to two weeks. Researchers will study how kisspeptin affects other hormones involved in reproduction and compare them with those seen in people with reduced and normal fertility levels. The hormone might also play a role in the timing of puberty and reproduction. One theory is that it starts the cascade of hormonal activity that results in sexual maturity and a trial is under way at Massachusetts General Hospital in the US. Doctors are investigating the effects of giving kisspeptin to 400 boys and girls aged 12 to 17 with a diagnosis of delayed puberty. “Kisspeptin gives us a novel and safe way of ‘pressing the accelerator’ of your reproductive system,” says Dr Channa Jayasena, clinical senior lecturer in reproductive endocrinology and honorary consultant and director of clinical studies at Hammersmith Hospital, part of Imperial College. The hormone has also been found to act on other parts of the body. Animal experiments suggest kisspeptin regulates the production of insulin, the hormone produced by the pancreas that helps convert sugar from food into energy. The hope is that it could be an important tool in the battle against diabetes, a condition that costs the NHS £10-billion a year. Human studies are under way into the link between kisspeptin and the condition, with scientists in India comparing levels of the hormone in people with and without diabetes. The researchers at Ganga Care Hospital, Nagpur, believe kisspeptin levels are significantly low in those who have low levels of insulin.